SolutionAfter the protective cover has been removed by erosion, water seeps into the limestone below, slowly enlarging openings in the joints, bedding planes, and porous beds through which it passes. A shale bed often forms a barrier to the downward movement, and water is forced to follow the rock layers down dip temporarily until an opening is found through the shale. The water moves slowly at first but as joints and other openings are slowly enlarged, a seepage becomes a trickle, and eventually the trickle becomes a stream. Fig. 1. View of portion of Cedar Sink, a large spectacular sinkhole in Mammoth Cave National Park which reveals a short section of an underground stream. The bottom of the sink is almost 300 feet below the sandstone-capped Mammoth Cave Plateau. Photo by W. Ray Scott, National Park Concessions, Inc. Fig. 2. 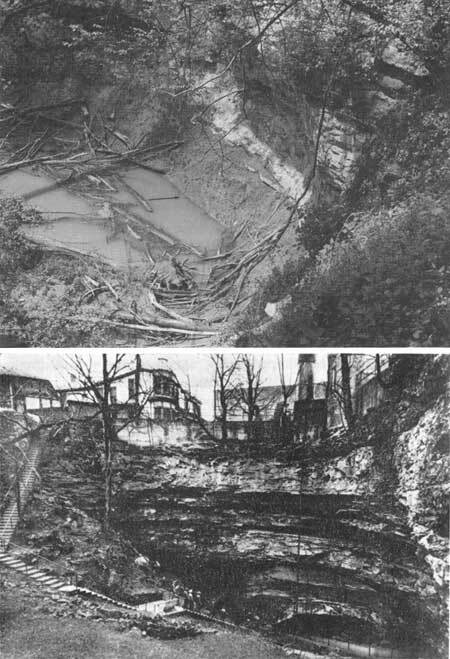 The entrance to Hidden River Cave, near Mammoth Cave, is in a sinkhole developed by solution, and aided by collapse of unsupported limestone layers. Photo courtesy of E. R. Pohl. Fig. 6. A later stage in the deepening of the Green River Valley is shown. As more of the limestone layers were exposed, active water circulation went deeper and formed more intricate erosion patterns. Some of the limestone is oolitic; that is, made up of rounded grains, and pore space is considerable. The pore space in these oolitic layers provides a principal path of water movement. In the oil fields of western Kentucky these same oolitic limestones have a high porosity and carry both oil and water. AbrasionCave forming starts with solution, but as the seepages become underground streams, erosion similar to that of surface streams occurs. The solution process continues indefinitely, but mechanical abrasion also helps as an erosion agent. Sand grains and gravel serve as cutting and grinding tools as they are carried along by the water, biting and gouging into the soft limestones. With this further enlargement of the passages, lack of support often causes roof collapse, adding still further to the size of the chambers and passages. Differences of opinion exist concerning the relative importance of solution and normal stream erosion processes. Undoubtedly, solution is the early and continuing process, perhaps the major one. The relative amounts of solution and erosion have varied in different caves and even in different parts of the same cave from time to time. Again there are differences of opinion as to where the main cave-forming processes occur, above or below the water table. Below the water table all open spaces in rocks are normally filled with water. There can be little movement of the water very far below the water table, and processes operating here are mainly solutional. The solutional processes are limited because water which has seeped down to these lower levels has become largely saturated with mineral material. Above is the zone of actively moving water in which both solution and stream erosion are active. As lower and lower passages are opened, water is diverted down to them from the upper levels through enlarged joints. The maze of passageways formed is intricate and different for every cavern system. In general those openings which follow bedding planes or porous beds are broad with low ceilings. Those passages whose development has been guided by joints are high and narrow. Intersection of joints may result in the formation of particularly high "domes" or deep "pits." If one looks up into such features, they are referred to as domes; if one peers down into them, they are called pits. In describing the probable formation of these dome-pits, Bretz (1942) suggested that most of these features developed in the following manner: first, there are two bedding-plane water courses developed, one above the other; second, the upper bedding plane is segmented by water descending vertically to a lower surface along a previously unused joint plane. There follows a period of solutional enlargement along this joint plane, largely by water trickling down. Domes and pits are generally easily distinguished from other cave features by their great height and depth and by vertically grooved walls formed by the solutional activity of running water. Passages referred to as the main cave "levels" are probably best thought of as controlled by different zones of very porous limestone. It is doubtful that such "levels" develop independently, and it is much more likely that several of the so-called levels had their beginnings simultaneously below the water table. All irregularities and differences in the limestone played a part in determining the location of underground passageways and openings. What may seem to be a very twisting, winding maze of underground passages with no predictable course has a controlled pattern of formation. It is a pattern which has been formed by the movement of water through limestone, always seeking available openings and the easiest path downward to a lower level and finding some limestones more soluble than others. The long passageways of the cave follow the northwestward dip of the rocks toward the Western Coal Field. With the forming of a cavern system, surface streams become almost non-existent, because the limestone is so riddled with solutional openings that nearly all the water falling on the land surface soon enters the underground system. Carried downward in the water are loose particles of sand, mud, and silt from overlying soil. Some passages have been filled entirely with such materials. Some of the soft clays and silts come from impurities in the limestone or from the shales. Backwater from floods on surface streams into the lower cave levels furnishes still another source of clay fill. Deposition BeginsIn the upper cave levels, vacated by the underground streams and now comparatively dry, there is little solution of limestone except in those openings which carry water continually downward to lower levels. The slow process of deposition begins and eventually intricate patterns of dripstone and flowstone are developed. DripstoneIt is virtually impossible to describe every form of the thousands of deposits in Mammoth Cave, but most of them are variations of three or four common types. The major number of forms are essentially dripstone patterns. Water seeping slowly down through cracks in the limestone of ceilings and walls evaporates when exposed to the air. In its downward journey the water has dissolved calcium carbonate from the limestone through which it has passed. The percolation of the water through the limestone beds causes a dripping or flowing action from the cave ceiling. When drops of water are suspended for some time from the ceiling, part of the limestone carried in solution is deposited to form an icicle-like, hollow tube or stalactite. Sometimes the drops of mineral water seep through the cave ceiling at a rate so rapid that most of the carbonate solution falls to the floor. Then a deposit may build up in the shape of an inverted cone called a stalagmite, each one having its "feeding" stalactite above. However if the rate of dripping should be very rapid, the carbonate solution will generally result in ponds or terraces of mineral material along the floor rather than forming stalagmites. 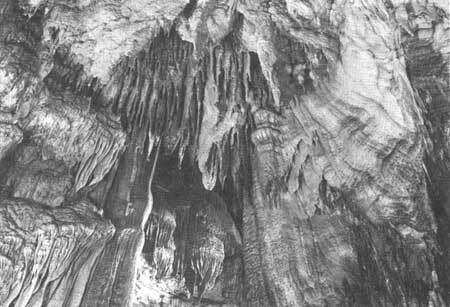 Gradually the opening in the center of a stalactite becomes choked with deposited limestone and then water trickles down the outside, and deposition of material causes an increase in the width and length of the stalactite (fig. 7A, 7B). Fig. 7. Formation of stalactites and stalagmites. A. With slow dripping, each drop of water remains on the stalactite for considerable time, and as evaporation takes place much of the carbonate is deposited. The stalagmite below thus receives little material. B. With rapid dripping, no drop remains suspended long enough for evaporation to proceed, and the growth of the stalactite is slow. Most of the carbonate is received by the stalagmite below. If the dripping is too fast, water will pond or run off on the floor and no stalagmite is formed. Growth RatesCave deposits are formed slowly, and no doubt some of them are thousands of years old. The rate of growth varies in different parts of the cave and in the same parts of the cave at different times. One estimate states that an "average" rate of growth for dripstone would be about a cubic inch in one hundred years. Evidence that dripstone growth rates vary from time to time is shown in the ringed appearance which these structures have in cross section. There are distinct concentric layers which resemble growth rings of trees. They mark interruptions in growth of the stalactite or stalagmite and do not represent seasonal growth as do the rings of trees. Cessation of dripping for one reason or another causes the surface of the deposit to dry out, and during this nongrowth period it becomes discolored brown by weathering (iron oxide forming from iron carbonate in the original deposit). Resumed deposition yields another clear layer of calcium carbonate. Because of the slow rate of growth of the cave formations and their fragility, visitors are not permitted to destroy the beauty of the cave by handling or breaking off any part of them. When a stalactite and its corresponding stalagmite continue to grow for a long time, the two join together to form a pillar or column. If enough calcium carbonate continues to be furnished to the growing column, a huge, impressive size may be reached. Another variation of dripstone which sometimes forms is known as a drapery or sheet effect, often formed by a row of stalactites joining together as they grow downward from a crack in the limestone ceiling of the cave. Impurities such as iron present in the seepage water bring out a brownish or reddish stain on the surface of the formation during dry periods. When lighted from behind, these colored stains, due to the iron or other impurities present, produce weird and fantastic effects, as is demonstrated by the Breakfast Bacon seen in the Drapery Room. FlowstoneFlowstone results from water flowing over instead of dripping from a rock surface. Some of the massive deposits seen in Mammoth Cave, which look like petrified waterfalls or some related feature, were formed in this way, by deposition from flowing water saturated with calcium carbonate. A thin sheet may become quite thick through continued deposition. As in dripstone a banded effect may be produced by intermittent periods of growth. When water seepage is rapid, the water collects into small pools of standing water occupying any irregularity on the cave floor. Calcium carbonate is deposited around the rim, again as a result of evaporation. The longer the pool exists, the higher will be the limestone rim formed around its edges. Some of these built-up rims are as much as a foot high and may be circular, crescentic, or irregular in outline. When irregular with scalloped edges, these deposits have been called "lily pads." When they block the floor of a passageway, such deposits form dams. HelectitesThe helictite is one of the most interesting of cave deposits. Helictites begin their growth in much the same fashion as stalactites. But something seems to go haywire, and the stalactite starts to branch out at the free, downward-pointing end or even to curve upward, so that the whole deposit resembles a complex fish hook. Sometimes the small branchlets seem to sprout out from the sides of the midsection. Just why these helictites branch so peculiarly, growing outward and upward again, is difficult to explain. One suggestion has been that the helictites may be formed because the openings at the ends of the growing tubes are constricted, resulting in a slow outward squeezing of the calcium carbonate solution. Capillarity may be part of the answer. At any rate, though not common, helictites are found in the drier parts of a cave. GypsumGypsum furnishes an unusual group of cave deposits, occurring in a wide variety of beautiful forms. The mineral is calcium sulfate plus water in contrast to the calcium carbonate of the dripstone. 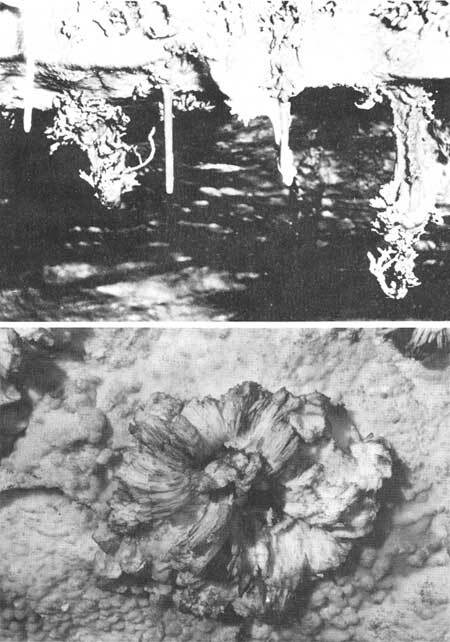 Generally the pure white appearance of the gypsum and the forms that it assumes will help the visitor to distinguish this unusual mineral from the dripstone. Fig. 1. Helictites, branching and curving weirdly, are calcium carbonate deposits which occasionally develop in drier parts of caves. The reason for their peculiar shapes is not completely understood. Photo by Caufield and Shook, Louisville, Ky. Fig. 2. Delicate gypsum rosettes are found only in the drier parts of caves, where slow evaporation of calcium sulfate through porous limestone causes the gypsum crystals to be forced outward into the cave. Blisters form, break, and result in "flowers." Photo by W. Ray Scott, National Park Concessions, Inc. The first cave known to contain gypsum was Mammoth Cave. Gypsum seems to be restricted to drier passages and is never found where dripstone is forming. Sometimes after gypsum deposits have been formed, the passages again become moist. The gypsum is then dissolved rapidly and disappears. However, although gypsum will not tolerate much water, it is itself a water-laid deposit, but only where there is slow seepage through limestone. Apparently the more porous limestone layers, usually oolitic, have been more favorable for the formation of gypsum, because the solution containing the dissolved calcium sulfate evaporates in the open pores of the limestone near the surface and forms a coating of mineral matter. Crystals are forced outward by the continued deposition of more gypsum in the pore spaces behind the original crystals. This process is much like the growth of ice crystals from a wet soil during the winter, for such crystals grow and curve in a similar manner. In this way gypsum commonly forms a "crust" over an entire cave ceiling or wall. Some layers form "blisters" when the gypsum is pushed outward, because of local, unequal crystal growth rates. With continued growth these blisters or ball-like protuberances burst and open into flower-like forms. A possible source of the calcium sulfate is a question that requires more study, for there are no known beds of gypsum above to provide the material. Disseminated gypsum is not known in the limestone. Marcasite (an iron sulfide mineral related to pyrite or "fool's gold") oxidizes to form sulfuric acid which in turn will react with limestone to form gypsum. This may provide an answer to the problem, since marcasite does occur above the cave limestones, particularly in an impure coal and dark shale which often occur in the Big Clifty Sandstone. Pohl (1935) has suggested that the marcasite source is a zone within the lower Golconda (Chester) formation. The gypsum source must be local, for gypsum deposits are not known in many of the caves in the Mississippian limestones of Kentucky and adjoining states. Some of the most extensive and delicate gypsum formations are found in the New Discovery section of Mammoth Cave which has not yet been opened to visitors. Here one finds entire passages whose walls and ceilings are covered with an amazing variety of gypsum "flowers," many long, slender needles, and fine masses of filmy gypsum so light in weight that the slightest whisper of the visitor is enough to make them sway back and forth. This is an underground wonder land which the park service hopes to open to visitors at some time in the future.